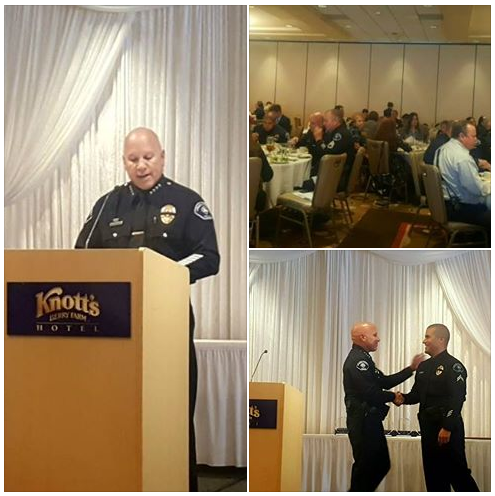 On May 19, 2016, the North Orange County Chamber celebrated the accomplishments of the Buena Park Police Department with their annual Police Appreciation Luncheon at the Knott's Berry Farm Hotel. In conjunction with the Chamber, Chief Sianez proudly presented Police Department Personnel with recognition for their efforts in 2015, along with remembering the four fallen officers lost in Buena Park. Yearly, Chief Sianez remembers Fallen Buena Park Police Officers Detective Darrel Cate, Corporal Tyler Pinchot, Officer Daniel Ackerman, and Los Angeles County Deputy Shayne York, with their own Table of Honor at the luncheon. 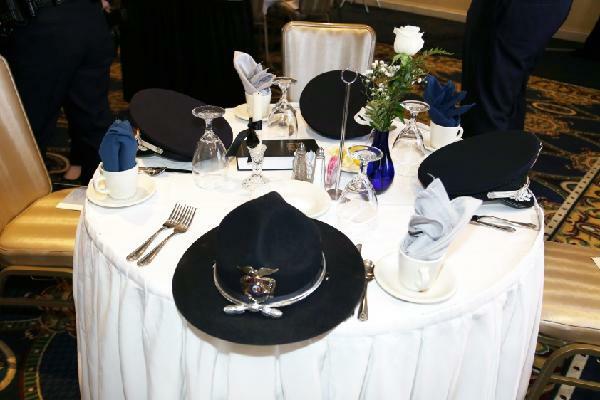 The hats of our heroes on the table symbolize a brave life that made the ultimate sacrifice. The table cloth is white, symbolizing the purity of their intentions to respond to their Country’s and Community’s call to arms – so that their children could remain free. The lone candle symbolizes the frailty of an officer alone on the street, standing up against his oppressors. The black ribbon on the candle reminds us of those who will not be coming home. The single rose reminds us of the loved ones our comrades in arms left behind. A slice of lemon is on the bread plate to remind us of their bitter fate. There is salt on the plate, symbolic of the family’s tears as they mourn the loss of a loved one. The glasses are inverted. They cannot toast with us today. The Bible represents the strength gained through faith to sustain those lost. As we look upon this empty table, do not remember ghosts from the past, remember our brothers and sisters. Remember those whom we depend on. They depend on us to bring them honor and respect. Remember our friends. They are the ones we love – who loved life and freedom as we do. Please honor and remember them.